Toulouse, 17th April – Airbus has shortlisted the five finalist student teams competing in the fifth edition of the Fly Your Ideas challenge. The radical concepts selected cover a wide range of innovations going from an alternative to satellite imagery, to improved aircraft taxiing, clever ways of boarding, new areas for luggage storage or offering a new business model using existing Airbus aircraft. Representing nine different nationalities and eight universities across Africa, Europe and Asia-Pacific, the five finalist teams embody true diversity, which is a key driver of innovation and performance. The students, competing for a €30,000 prize, also demonstrate a wide variety of disciplines from Natural Sciences to Engineering and Business. Their inventive ideas were selected from over 350 entries in Airbus’ biennial global student competition, run in partnership with UNESCO. Students’ ideas had to answer one of five challenges identified by Airbus to provide sustainable future solutions. The innovations proposed by the five finalist teams look at alternative business models, passengers’ experience and flight operations. The five finalist teams – from Australia, France, Hong Kong, Nigeria and the UK – will soon travel to Toulouse, France, where they will spend a week at the Airbus ProtoSpace facility to prototype, test and visualise their ideas using state-of-the-art equipment with personal guidance from Airbus. At the end of their week at Airbus, the students will present their innovative projects and the newly developed prototype in front of Airbus experts and personalities from the aerospace and academic world. A radical concept that turns a commercial airliner into an ‘Earth Observation Device’ by installing equipment into the belly of the aircraft to monitor ground activity during flight. An alternative to satellite imagery, it opens up new opportunities such as ecology analysis and urban planning. An airport taxiing system that uses sensors and algorithms for automated Ground Traffic Control, both in the tower and on the aircraft, to significantly improve aircraft traffic at airports and thus reduce emissions. A revolutionary boarding system that uses a real-time mobile app to assign boarding status to passengers according to their luggage size. The Compact Luggage Strategy (CLS) addresses current storage issues in over-head compartments by distributing passengers across the aircraft according to the size of their baggage. A clever aircraft cabin design that locates a Private Stowage Compartment (PSC) underneath passengers’ feet, utilizing the space between the cabin floor and the cargo ceiling. A fire-fighting solution that incorporates modular systems using pressurized fire retardant containers fixed to fast-loadable pallets for a network of Airbus A400M aircraft, to create a system of aerial firefighting platforms that can be used for rapid wildfire suppression. The winning team will receive a €30,000 prize with the runner-up team receiving €15,000 at a live event taking place on 17th May in Toulouse. 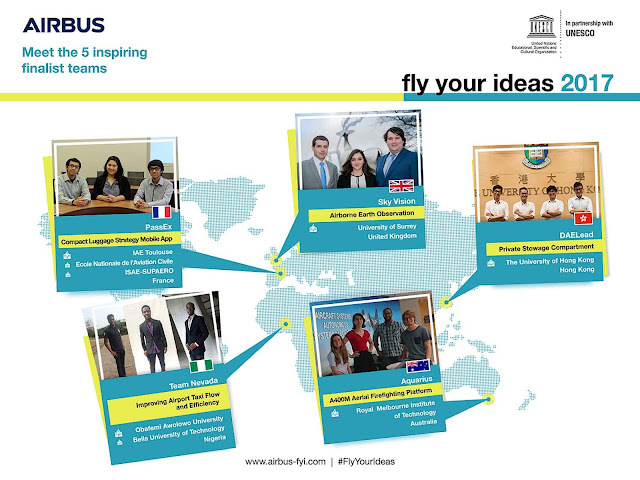 Airbus launched Fly Your Ideas in 2008 with the aim of engaging with universities and students worldwide and from all backgrounds to: stimulate innovative ideas for a sustainable aviation industry and identify opportunities for R&T development and/or interaction with academic research teams. The challenge received UNESCO patronage in 2012 with a renewed partnership in 2014 and 2016.